On August 7, the Spinning Enhanced Visible and Infrared Imager (SEVIRI) instrument on MSG-3 captured its first image of the Earth. This demonstrates that Europe’s latest geostationary weather satellite, launched on 5 July, is performing well and is on its way to taking over operational service after six months of commissioning. 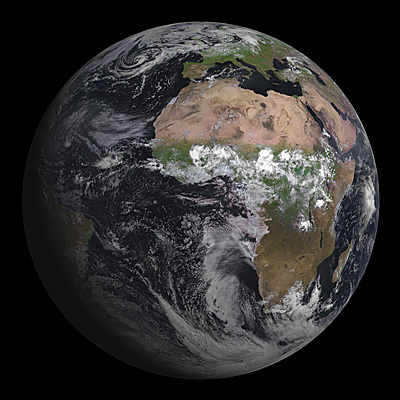 MSG-3’s first image of Earth, acquired on 7 August 2012 by its Spinning Enhanced Visible and Infrared Imager (Credits: Eumetsat).